SUPERCHARGE YOUR HEALTH: Increase your energy, reach your weight management goals, and transform your health with this superfood supplement bundle. CREATE ENERGY NATURALLY: Curb cravings, sharpen focus, boost your metabolism and increase your energy with organic superfoods in Boost Focus Fuel. CURB UNHEALTHY CRAVINGS: Support your serotonin levels and make it easier to stop emotional eating with organic garcinia cambogia and organic cocoa in Boost Focus Fuel. Transform your health with more energy, reduced cravings, satisfying protein shakes and superfood juices. You'll save a bundle off individual product prices with this all-in-one pack of organic nutritional goodness. The Transform Pack gives you three organic whole food supplements that work as one to support energy, weight management and renewed vitality. Nothing artificial is added, it’s just the good inside. Get back to burning calories and fat at optimal levels. The right herbs and plants can temporarily boost your metabolism, so you burn more calories, even without exercise. Boost Focus Fuel is specially formulated with organic teas, herbs and fruits to boost metabolism, sharpen focus, and fuel natural energy. Metabolism movers include organic green coffee beans and organic green tea. All with only 140 mg of natural caffeine per serving so you won’t feel jittery. Focus is sharpened and cravings are curbed by organic cocoa, organic garcinia cambogia and the organic green tea. Fuel your natural energy with organic Rhodiola rosea and organic eleuthero root, adaptogen herbs that strengthen the body’s response to stress. Complete plant proteins help you get through everyday activities with ease, support healthy muscles, and fuel your active lifestyle. Organic Super Protein is everything you’ve been looking for in a protein shake to build, strengthen and recover. You get 18g of certified organic, clean, complete plant proteins that are easy to digest, plus plant-based digestive enzymes so there’s no uncomfortable bloat. Organic Super Protein provides delicious vanilla shakes sourced from organic superfoods, energizing MCTs and heart-healthy omegas. It is certified organic, non-GMO, Vegan, No Soy, No Dairy, and No Added Sugar. 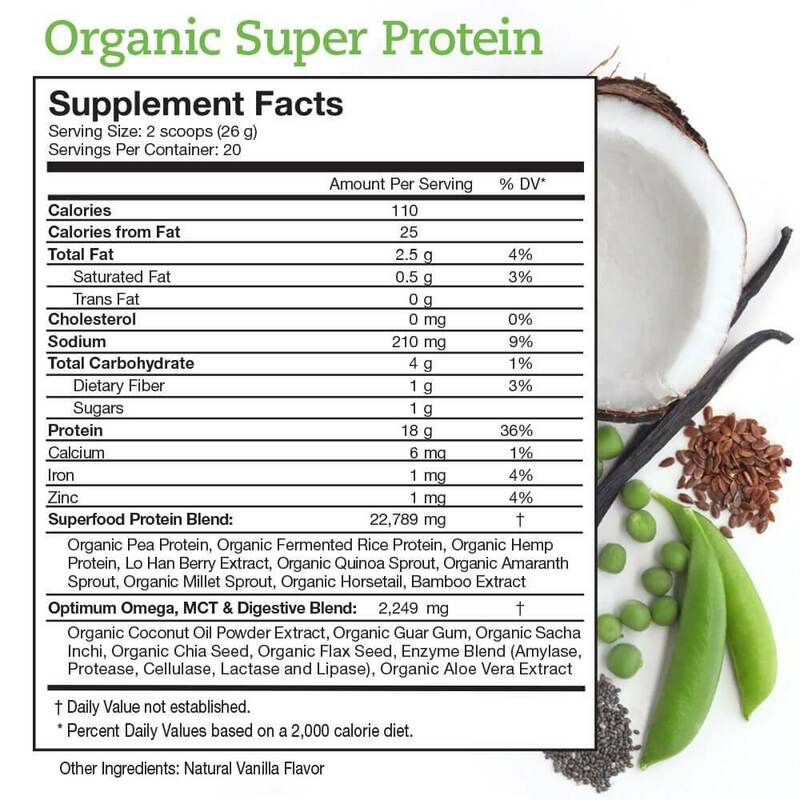 Organic Super Protein is the perfect fit for your busy life. This satisfying vanilla shake is easy to make and tastes great. In an ideal world, every meal you eat would be filled with nutrient-rich superfoods that were grown organically. In reality that doesn’t always happen. 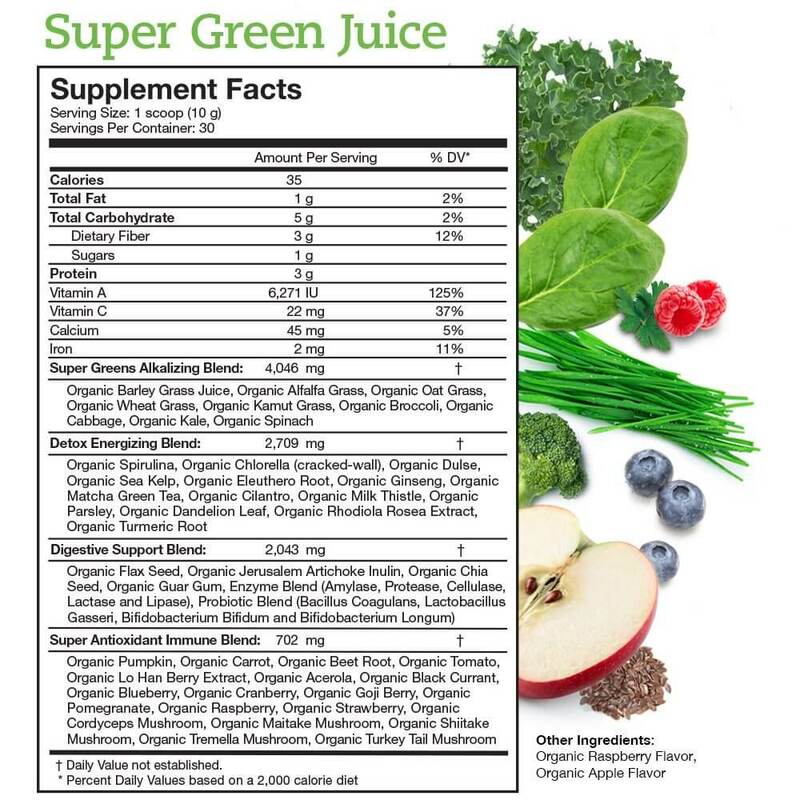 So getting 44 organic superfoods in one tasty juice is just what you need to help fill the gap. These hard-to-find superfoods are full of the nutrition you need to nourish your body. Simply mix a scoop of Super Green Juice with your favorite liquid, and drink in the goodness of natural vitamins, minerals and antioxidants. You’ll alkalize, energize and support immunity. With no added sugar and organic raspberry and apple flavors, it’s a tasty organic greens juice free of the usual prep or cleanup. Get all your superfoods in one pack to increase energy, reach your weight management goals, and supercharge your health. Boost Focus Fuel comes with a special blend of organic plants to boost metabolism, sharpen focus and fuel natural energy. Organic Super Protein provides 18g of clean complete protein sourced from organic superfoods to support healthy muscles. Super Green Juice gives your body 44 organic superfoods to alkalize, detox, energize and strengthen immunity. 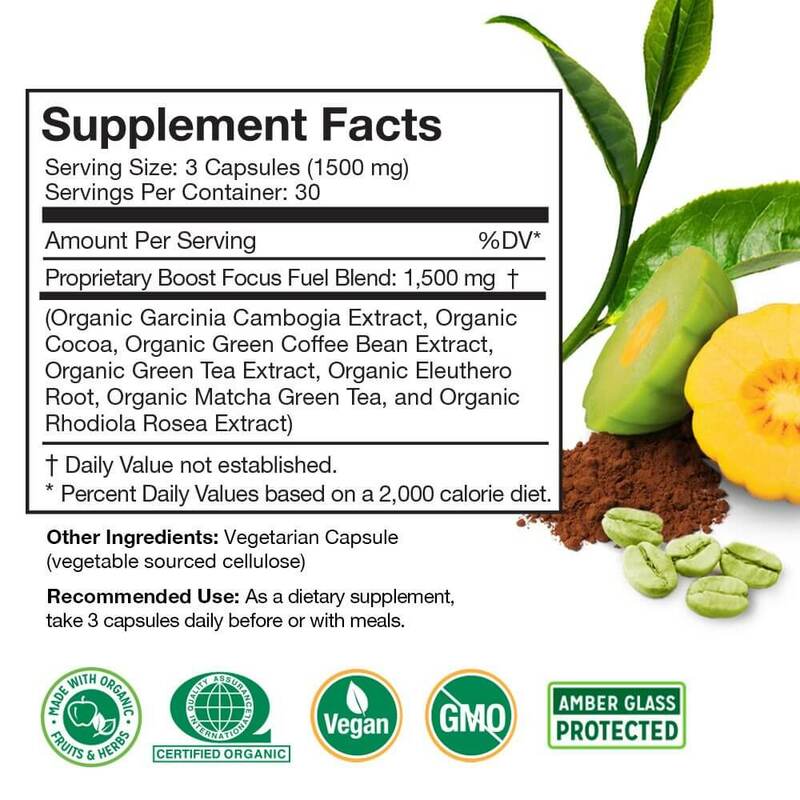 Each of the organic extracts is renowned for support of metabolism, appetite control, mental clarity and energy. Together, they are even more powerful. This deliciously smooth and satisfying vanilla shake is different because you get complete proteins from organic superfoods giving you protein that is nutritious and easily absorbed. 18g of organic superfood protein for filling, satisfying energy. Organic MCTs for lasting energy and metabolism support. High in Omega’s (essential fatty acids) for muscle and heart health. Easy to digest with added enzymes, so no belly bloat or discomfort. Healthy fast food that is easy to mix at home or on-the-go. No Soy, no dairy, and no artificial ingredients. With no added sugar and only 110 calories per serving, you’ll be amazed at just how smooth and creamy this vanilla goodness is from start to finish. Vitamins & minerals only from organic plant sources. Alkalize with organic greens and organic grasses. Probiotics & prebiotic to cultivate good gut health. Detox with chlorophyll-rich organic spirulina and chlorella. Natural energy from organic herbs and Matcha green tea. Immune support from organic vitamin C and medicinal mushrooms. Fiber (3g per serving) for heart and digestive health. Antioxidants from organic berries and veggies. Digestive enzymes to banish belly bloat and boost absorption. The Transform Pack provides (1) Boost Focus Fuel (90-ct) (1) Organic Super Protein (20-servings), and (1) Super Green Juice (30-servings) and you save a bundle off individual product prices.